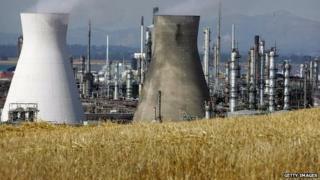 Chemical firm Ineos has announced plans to hand over up to £2.5bn of shale gas revenues to communities close to its wells. The company has bought the license for shale gas exploration and development across a 329 square kilometre area around its Grangemouth power plant. However Friends of the Earth Scotland slammed the move as "a transparent attempt to bribe communities". The move would see those living in a shale gas community benefit from the output of about 200 wells, and Ineos estimates a sum of £325m would be split between them. The firm says homeowners and landowners directly above the wells would share £250m, while another £125m would be shared between community projects like schools, parks and community centres. Ineos chairman Jim Ratcliffe said the move mirrors the way revenues are shared in the USA. "Giving 6% of revenues to those living above Britain's shale gas developments means the rewards will be fairly shared by everyone," he said. "Ineos has also hired some of the world's leading shale gas experts to make sure the gas can be safely extracted in an environmentally responsible way." However, Mary Church, head of campaigns at Friends of the Earth Scotland, said the move was a "transparent attempt to bribe communities". She said: "Fracking is a dangerous, dirty industry and all the money in the world can't hide that. "Ineos's offer relates to the production phase, which is a good 10 to 15 years off, if indeed the industry ever gets that far. "The highly speculative sums talked about by the industry hide the true cost of fracking to the climate, communities and the local environment." The Scottish government has called for devolved powers on fracking after the UK government decided to press ahead with plans to let companies drill at depths of 300m below private land without consent.